The leading surface active cleaning agent/radioactive decontaminant, for laboratory, medical and specialised industrial applications. Surface active cleaning agent, and/or radioactive decontaminant, for laboratory, medical and specialised industrial applications. NOT suitable for domestic applications. Supplied as a liquid concentrate, for dilution with water. 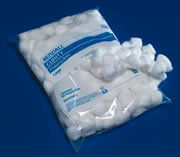 For 'manual' cleaning, or for use in anultrasonic cleaning bath. Biodegradable *, phosphate-free, Bactericidal **, non-flammable and totally rinsable. Milky white, non-viscous liquid, having faint odour. DECON 90 is alkaline. The concentrate having a ph in excess of ph 13. Supplied in 1 litre, 5 litre and 20 litre high density polyethylene containers, with tamper-evident, screw-on caps. For cleaning and/or decontaminating glassware, ceramics, rubbers, plastics, stainless steel and ferrous metals. Being alkaline, DECON 90 is NOT suitable for use on non-ferrous metals, notably aluminium and zinc, or on polycarbonate. An emulsion of anionic and non-ionic surface active agents, stabilising agents, non-phosphate detergent builders, alkalis and sequestering agents, in an aqueous base. Decon 90 does NOT contain Phosphates, Enzymes, EDTA/NTA or Chlorine Bleaches. ** Decon 90 satisfies the criteria in BS EN 1040 1997 for bacterial activity. Contains five skin softening compounds, plus allantion to relieve dry, fissuring, peeling, chapped, or irritated skin. Sparkle Optical Lens Cleaner can be used on microscopes, eye glasses, safety goggles, and magnifiers. Not to be used with contact lenses. Sparkle Glass Cleaner can be used on glass, stainless steel, etc. A premium pad material that provides maximum absorbency for scrubbing and cleaning. Sterile, non-woven sponges designed for moderate cleaning. Available in convenient sizes for a variety of uses. Packed in convenient poly bags. Designed for a variety of uses throughout the laboratories. Made from high quality rayon fibers. A wide selection of bench top covers from economy layered to premium ultra absorbent. Alconox detergents safely cleans glass, plastic, metal, rubber, and porcelain without leaving a film, residue, or any scratches. Very versatile and cost efficient. The original anionic powder detergent for manual and ultrasonic cleaning. An odorless, high sequestering powder. It helps to decontaminate radioactive surfaces. 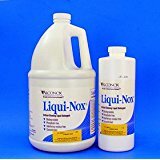 Non-ionic, low foaming cleaner for use in labware washers, parts washers, power spray systems, manual and ultrasonic cleaning. Corrosion inhibited formula recommended for glassware, metals, plastic, ceramic, porcelain, rubber and fiberglass. Free rinsing for reliable results no interfering residues. USDA authorized. Dilute 1:200 and it has a pH 12. A phosphate free anionic and non-ionic liquid detergent for manual and ultrasonic cleaning. Mild pH. Combine Alconox powder with this protease enzyme to effectively remove proteinaceous soils. Ideal for pre-soaking. It also cleans reverse osmosis installations. A highly alkaline liquid detergent and wetting agent that is soluble in soft or hard water. It is extremely effective on porcelain, metals, electronic parts, etc. It protects and lubricates the interior working parts of the washer. Alconox detergent in an effervescent tablet form for use in syphon type washer rinsers for the cleaning of pipettes and test tubes. Low foaming phosphate-free, concentrated, liquid cleaner and metal brightener, high performance removal of metal oxides, scale, salts and inorganic residues in lab-ware washers, parts washers, power-spray systems and manual and ultrasonic cleaning. Corrosion inhibited and free rinsing leaving no interfering residues. Ideal for acid washing and rinsing. Dilute 2:100 and it has a pH 2.5. Non-ionic, low foaming phosphate free powdered enzyme cleaner for use in labware washers, manual and ultrasonic cleaning. Corrosion inhibited formula recommended for glassware, metals, plastic, ceramic, porselain, rubber and fiberglass. Free rinsing for reliable results and no interfering residues. Passes inhibitor residue test. Dilute 1:200 and it has a pH 11.5. Low foaming phosphate free liquid cleaner for use in labware washers, manual and ultrasonic cleaning. Corrosion inhibited formula recommended for glassware, metals, plastic, porcelain, rubber and fiberglass. Free rinsing for reliable results and no interfering residues. This detergent passes the inhibitory residue test. Dilute 1:200 and it has a pH 11.5. Non-ionic, concentrated detergent for labware washers, PC board washers, power-spray systems, ultrasonic cleaning systems and manual cleaning. Specially formulated to remove oils, resin rosins and fluxes from printed circuit board, electronic part, phosphate sensitive labware and nuclear contaminated equipment with no interfering conductive residues. 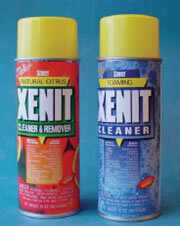 Excellent replacement for solvent cleaning. Dilute 3:100 and it has a pH 11. A concentrated phosphate free surface cleaner used to clean equipment and apparatus, which is made from glass, quartz, porcelain, metal, rubber, and plastic. Specially designed for ultrasonic cleaning machines. Cleans glass, most metals, plastics, and rubber. You can work with any concentration. Contains no phosphates and it is biodegradable. Even removes radioactive contaminants. Not to be used on zinc, magnesium, or aluminum. Aqua-Clear™ Water Conditioner stabilizes water in water baths and other water systems. Just 2 ml per liter of water provides long lasting protection against the growth of algae, bacteria, and molds which often contaminate standing water. It also protects pumps and thermostats and helps prevent tubing from clogging. In addition, it may be added to the water that is used in developers for color or X-ray films. It will not harm the film and permits longer use of the same solution. Aqua-Clear™ Water Conditioner adds a blue tint to the water which will fade after about 3 months reminding you to change the water and add new conditioner. This cleaner may be used on brass, copper, steel and other metals to remove rust and metal-oxides. Comes as a concentrate. Dilute to 10-12% with water for use with ultrasonic machine. Electric benchtop dryers offer a compact footprint and accelerate drying of labware with warm, circulating air. Conserve benchtop space by placing single-sided models up against the wall. Double-sided models double your capacity with only a slightly larger footprint and can be turned perpendicular to the benchtop for easy access to both sides. 400 watts of drying power gently circulates heated air into and around items to decrease drying time. Heat selector knob with three temperature settings: high, medium and low. Power button illuminates when in use, and an 8-amp @ 120V (4-amp @ 230V) circuit breaker and independent thermo-fuse protects unit from overheating. Select from single and double sided models with up to 76 peg locations and 4 baskets. Electric drying efficiency is enhanced with a replaceable polyurethane foam filter that keeps warmed air dust free. Redirect air flow by inserting plugs instead of pegs into unused peg holes. Like the non-electric benchtop models these freestanding dryers have sturdy bases with excellent balance and can be placed on any flat surface. 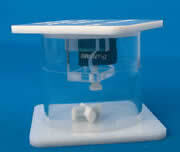 Removable polypropylene baskets serve as storage for small labware and extra pegs. For the first time EMS introduces a unique beaker with a silicone bottom that allows you to store all of your tweezers and tools in cleaning solution and never damage the tips. Instruments may be placed in the beaker with the tips only immersed in distilled water and or cleaning solution. 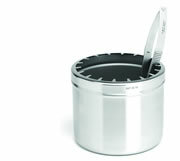 This allows the instruments to be kept clean and safe and ready to use . The Silicone bottom prevents the tips of the instruments from being damaged and the top of the beaker is compartmentalized and segmented allowing for each tool to be kept separate. The beaker measures 10 cm in diameter and it is 8 cm in height. A plastic, full length, bib-type apron. Handy protection in a compact envelope. Smooth finish, size 28"x46" (71cm x 112cm; 1¼ mil thick). Please see our complete listing. This new concept of washing the Diamond knives using magnetic stirring action (with special stirring bar) gives you a fast, clean and safe method to remove particles that are left on the knives edge after sectioning. Since most of the EM labs already have stirring plates, the Diamond Knife Wash has been designed for use with your existing unit, saving you the need to purchase an extra one. It is universal and can be used for all type and brands of Diamond Knives, including the Diatome Histo Knife. Warning: Never use on a hot plate. If used on a combination Stirrer/Hot Plate, make sure the heat is off. Consists of 5x5 ml vials of cleaning solution, 4 rods for cleaning the knife edge, and 1 hair curl for the removal of sections from the knife edge and the trough. Triton X-100 is a low concentration soaking solution in distilled water. It is a non-ionic (neutral pH) solution used to soften dried debris on the edge of the knife prior to recommended cleaning. Also used in whole cell preparations. Also see listng in Chemicals. Made of human hair; it is good for removing sections and cleaning the diamond knife. For direct manipulation of sections and small tissue samples this tool is perfect for any occasion. May be used during ultramicrotomy to carefully tease sections that are in the Diamond Knife boat. The Eyelash comes on a Sable Brush handle made from the highest quality wood. These Eyelashes may be cleaned and sterilized with alcohol and a tissue.